Watch the first televised presidential debate on YouTube. Kennedy and Nixon go head-to-head in 1960. Today, this debate is often discussed as an example of how much your personal appearance matters when it comes to an important televised presentation. Kennedy took great care to look good on camera. He wore a neatly pressed dark suit. He appeared clean shaven. Also, Kennedy actually wore makeup during the debate. By contrast, Nixon didn’t seem to bother much with his appearance. He wore a rumpled suit. Under the bright lights of the TV cameras, every wrinkle in this light-colored suit became deeply exaggerated. Nixon also pooh-poohed makeup. At certain points in the video, you can see sweat beading on Nixon’s face. And, oh dear…I wonder if Nixon even shaved. Is that razor stubble I see? 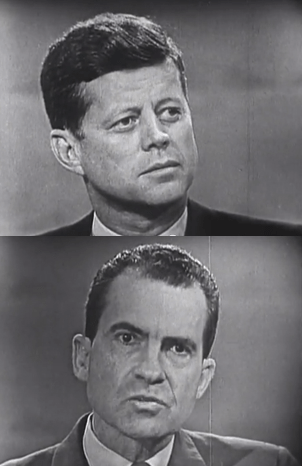 When people talk about the first televised Nixon-Kennedy debate, you most often hear them discuss the way each candidate looked. Very few people talk about the actual content of this debate. For the TV generation — appearance matters. Let’s fast forward 35 years from 1960. In 1995, I participated in my first video conference for business. In the mid-90’s, video conferencing was very expensive, but it allowed us to significantly trim travel costs with our established customers. Today, I still participate in business video conferences. Inexpensive and easy-to-use tools like Skype and Google Hangouts help keep travel and productivity costs in check. I also participate in webinars and perform in online videos on YouTube and lynda.com video tutorials. Your audience is the TV generation. They have expectations for how people look and perform on screen. If you fall short, they’re probably not going to tell you to your face. But will they secretly judge you? Sure. They can’t help it. There’s a heck of a lot of work that goes into looking and sounding acceptable on camera! Lighting. Hair. Makeup. Wardrobe. Camera angles. Props. Set design. And much, much more…. In person, you may look like a polished professional. And even if you’re slightly “off” — a few small raindrop stains on your suit, a bit of a 5 o’clock shadow, faded post-coffee lipstick – we regularly overlook these minor flaws in people we work with in person. But on camera? With people you have yet to meet? As the saying goes, you don’t get a second chance to make a first impression! If you’re going to participate in a video conference for business, I strongly suggest that you try conferencing with people who already know you. Meet people in person first – they’ll be far more likely to forgive any technical shortcomings with regard to your video appearance. If they already like you in person, they’ll actually be glad to see you on camera. However, if you’re looking to make a positive first impression with customers by offering an online video experience — invest in the important facets of video production. Take some time to polish your personal appearance and presentation techniques.